Sales guys --- show them proof! Keep an up-to-date deal sheet – instead of a resume - on your PC at work which you can share with recruiters when they call. Your IT department won’t accidentally find it and automatically assume you’re looking for a new job. Employers care 1st about who you’ve sold – 2nd how much you’ve sold – and 3rd is your rolodex useful to them. While you may not want to have a resume in circulation with contingency recruiters, a deal sheet can only help you. 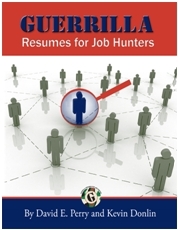 Put the deal on your Job Hunting Case Study LinkedIn profile using a Booklet or Slideshare.